If you're expecting a bouncing baby boy then you have come to the right place for great ideas to make your shower invitations. I got the basic idea from the October 2007 issue of Scrapbook Trends Cards Magazine. The patterned papers are all from the Basic Grey collection Archaic. I have run thin double sided tape along the two sides and the bottom of the card and stuck it down. 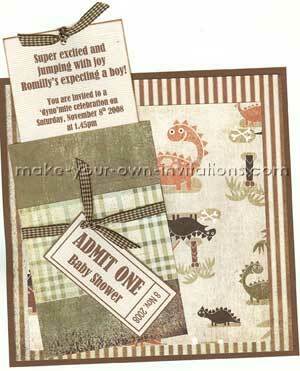 Send us your homemade Baby Invitations and tips here.